KELLEY Ball Penetration Apparatus for Concrete Testing - The apparatus is used to determine the workability of Portland cement & concrete. The Kelly ball test is considered to be simple and much faster than the slump test. Twice the Kelly ball reading approximately equals the slump. It consists of a cylinder with a ball shaped bottom and handle, together weighing 15 kg. A strip frame, guides the handle and serves as a reference for measuring the depth of penetration. The handle is graduated in mm. Penetration can be recorded to the nearest 0.5mm..
We are leading manufacturers, suppliers & exporters of KELLEY Ball Penetration Apparatus For Testing Lab for Concrete Testing Lab. 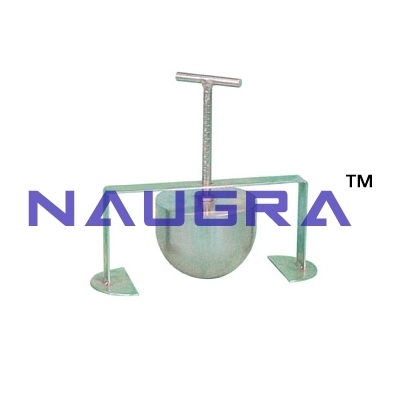 Contact us to get high quality designed KELLEY Ball Penetration Apparatus For Testing Lab for Concrete Testing Lab for schools, colleges, universities, research labs, laboratories and various industries. We accept bulk orders for government tenders in all countries around the globe.